The setup described below is for an Epson 7900 being calibrated to a Fogra 39 standard. Linearisation Curves will be generated using Lab mode. If any terms or functions mentioned are unfamiliar please refer to the V5 User Manual available on the installation DVD or via the Serendipity Software website. 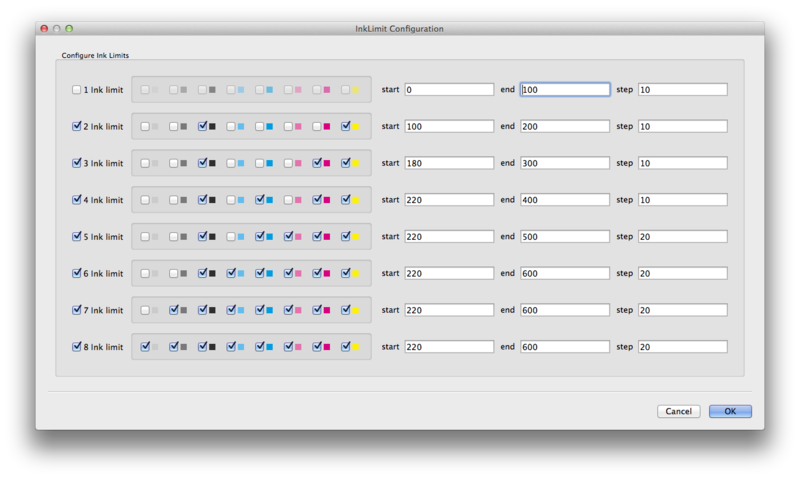 Make sure a CMYK ICC profile is selected for the Output ICC profile. Standard SWOP is fine, any one will do for this stage – it just needs to have the same colour space as you are using. Assign the Output and Media created earlier. Set the Press Match ICC profile to an ISO/Fogra profile. In this example we will be using ISOCoated_v2_eciF39. Rendering Intent is set to Relative or Absolute Colourimetric. The rendering intent does not factor in at this point but will later. When the chooser window appears, select the Media and Pagesetup and Submit. Note: The choice of Light Cyan and Cyan dots may differ if a Paper Profile is being created for a bi-directional media setup. Here is an example where experience with printers comes into play – when printing bi-directionally it is not uncommon for small Cyan dot to cause visible moire pattern in large areas printed of predominantly Cyan. This is common to many inkjet printers due to the small size of the dot, its placement, the white space left around it and how that is perceived by the eye. Once the patches have been selected, save the Paper Profile and assign it to the Media via the Paper Profile button in the Media datatype created earlier. Pick the appropriate Pagesetup from the print dialog and click Submit to print. When all readings have completed, Submit the chart. With the Media now linearised the next step is to create an ICC profile. Make sure there are no other colour management settings enabled except for the Paper Profile and the Linearisation Curve. Select Submit menu > ICC Target. Use the file chooser to navigate to an ICC target of choice (in this case an IT8/7.4 Visual) and Submit it to the Pagesetup and Media. 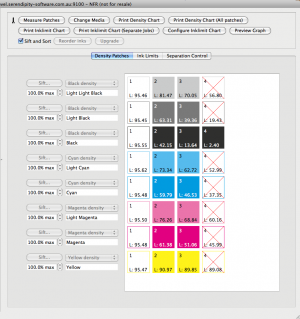 Submitting using the ICC Target option ensures all ICC, dot gain and colour correction is disabled for printing. ICC target charts are generated by ICC creation software, they must be submitted in a TIFF or EPS format. Turn on the Always Use ICC option in the ICC Profiles section of the Pagesetup and save it. Click Print Chart to submit and print a Calcheck Chart, either generated from your Press ICC profile or an imported chart. This can be printed using either Relative Colourimetric intent (selected in Pagesetup) if the paper has a white point close to the Fogra standard or alternatively, use Absolute Colourimetric intent. If the calibration FAILS slightly and you have iterative ICC software, you can iterate the profile to pull it into standard and try Calcheck again. If you don’t have such software or the calibration fails by a large Δe margin, it’s back to the beginning to try different settings in the Paper Profile.